The interesting thing is that the one aspect of his game that has always held him back as a player was his putter, but he finished fourth in strokes gained putting on the PGA Tour in 2015, without seeing a real noticeable gap in his tee to green game, which is something to watch in 2016. On top of that, he’s friends with J.R. Smith, his swing is delightfully weird and that GIF above may be the only known footage of Westwood not wearing white pants. His story is worth noting too because he really did come from nothing and his return from the very bottom of the professional game, where he thought about quitting entirely, is pretty remarkable and he’s done it while being one of the more honest and entertaining players in the game. Westwood hit Roger Maltbie with a tee shot. Westwood: "There's a lot to hit, Rog." Maltbie: "You're gonna play the fat card!?" His interview with David Feherty, linked below, is one of the best Feherty has done. New form of #TourSauce: Emiliano Grillo asks John Paramor to go through the rehearsal for him. @jalnichols @PGATOURSMartin Grillo is a miniature savage. Going to do work on tour next year. Emiliano Grillo with the sneak club twirl … on the layup shot out of the rough. I like this kid already. Look, the kid can play and the fact that he basically twirls his club on nearly every shot like he’s Shane Lowry is pretty fun and much like every player around his age, he legitimately believes that he’s been wronged by the golf gods when a ball doesn’t drop, even from the fairway. Trust me on this one, you’re going to love watching Emiliano Grillo in 2016. One of the worst things to happen in golf in 2015 was that Graeme McDowell really didn’t do anything of note on the course. He started his year by finishing tied for 9th at the Dubai Desert Classic, but wasn’t able to register any other top tens, which in turn, deprived us of seeing one of the most unique swings in all of golf and someone who never fails to make me laugh with how he reacts to nearly every shot. One of my favourite swings in all of golf. Don’t know what this move is. In turn, we also didn’t get to hear enough from McDowell in interviews and he’s really one of the game’s most thoughtful players. Near the top of my wishlist for golf in 2016 is a better year for Graeme McDowell simply because golf is more fun when he’s playing well. Victor Dubuisson at the Junior Ryder Cup. Victor’s not a fan of his ball. 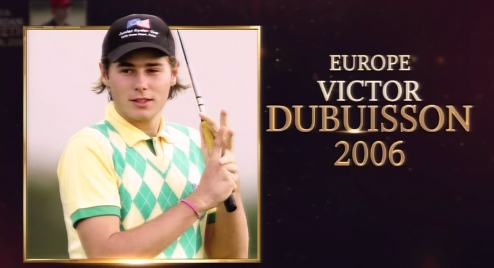 On a side note: my mother would have ranked Dubuisson at number one because she thinks he’s perfect. Putting Tiger here feels both too high and too low, which probably means that he’s right where he should be. If this was Tiger from 2000 or hell, even Tiger from 2013, he probably would have received ten points in all five categories and put up a perfect score, but this is where we’re at with him. Nobody who made this list scored worse than him in the ability category and considering where he is in the OWGR, I think that’s understandable, but he’s still Tiger Woods and I can’t get away from that idea. In part one of this series, I mentioned that I couldn’t bring myself to watch Ernie Els anymore on the greens because it was just too painful to see someone that elegant battle the yips, but with Tiger, I just can’t pull myself away despite being so mortified at what he gives us from week to week these days. It’s the same reason why the Lakers are still appointment viewing for me even though Kobe clearly doesn’t have it anymore. He still plays pretty aggressively, especially when he gets into positions where he can be creative and shape the ball, and there’s no denying that there would be no #TourSauce without him. Tiger Woods is #TourSauce and even though he’s nowhere near the player he used to be, he certainly still acts like he is when he stripes one down the middle or he makes a horrendous swing. No one knows that 2016 will bring for Tiger Woods, and I’m sure if he was being honest, he’d say the exact same thing but there is always still a glimmer of hope that he might figure it out and turn it around. This guy still exists somewhere, I think. I hope. It always makes me laugh when people label Johnson as an underachiever due to the fact that he hasn’t won a major championship. He’s won nine times on the PGA Tour since 2008, which is a great career for most players, and I’m sure that some of the label has to do with the narrative that surrounds him about how he’s not that bright, which is something Kyle Porter and Chris Solomon debunked quite well on the No Laying Up podcast after the PGA Championship. Sure, he emotes at the level of a folding chair, but doing anything more than that’s just not the player or person that he is, and his game is good enough to do all of the talking. His laid back approach where he doesn’t let things get to him just adds to his appeal. He’s not the most typical player when it comes to excitement, but the way he plays makes him a must watch at all times. The #TourSauce is incredible and the swings of emotion are off the charts. He’s sponsored by MLB.com for some reason and as much as he’s known for contending as an amateur at the 2004 U.S. Open and the chain smoking, his return to golf after dealing with tragedy and dumping the cigarettes is a fun story. I get the sense from watching Levin that I’m not looking at someone who’s completely balanced; someone who is ready to explode at any given time, but not really do anything destructive. That is the very definition of watchable. A few weeks ago, when the PGA Tour was in Kuala Lumpur for the CIMB Classic, Levin was featured heavily and it was the main reason to tune in to the coverage. The next week, the WGC event in Shanghai seemed to lack a distinct amount of pop, and I figured out why pretty early. Late night golf really isn’t the same without Spencer Levin. Do I have a problem? Probably, but so do you if you don’t love watching Spencer Levin. Quick club twirl and the lightning fast tee toss. When he hit driver off the deck twice on Sunday at the Frys a few weeks ago, he said afterwards that even though he lost, it was the correct play in both instances, even after he duck hooked one into the trees against Grillo in the playoff. That’s the kind of attitude that gets you a lot of points, at least with me. Lastly, I was on the Na for Gleneagles campaign in 2014 and I’m going to be on it again for Hazeltine next year. Not only is he good enough to play on the Ryder Cup team, he still plays slow enough to frustrate the hell out of any opponent and get under their skin. This needs to happen. Ridiculous approach from Angel Cabrera on 13. Part of me wishes that he would be more consistent and show up at the top of the leaderboard with more regularity, but on some level, I also think that adds to his appeal. When he’s playing well, make sure you’re around to watch it because you never know when you’re going to see it again. The next post will examine golfers 20-11.